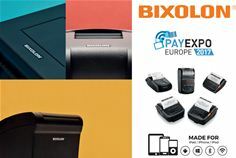 PayExpo 2017 (4-5 October 2017, London, UK) – BIXOLON a leading global manufacturer of advanced Mobile Label and POS printers, will be encouraging visitors to discover its latest range of dynamic printing solutions for the evolving payments market place on stand G25 at PayExpo Europe 2017. Showcasing a range of trend sensitive applications from multi-platform POS ecosystems to digital payment, BIXOLON will be demonstrating its sophisticated range of POS, Label and Mobile printers, such as the NEW SRP-Q300 3-inch (80mm) Direct Thermal cube desktop printer offering flexible mPOS receipt printing from Android™, iOS™ and Windows® mobile devices. Alongside the SRP-S300 Linerless label and receipt printer. Championing the next generation in mPOS connectivity, BIXOLON will be demonstrating the previously missing link between smart devices and wired POS peripherals with its mPOS hub solution, B-gate. Eliminating the need for expensive POS system setups, B-gate wirelessly connects to the host tablet device while supporting one charging port and connectivity for up to four USB peripherals via its powerful Bluetooth or Wi-Fi interface. BIXOLON will also be exhibiting its comprehensive range of 2”, 3” and 4” mobile printing solutions including the newly released next generation highly connective 4-inch mobile printer, the SPP-R410. BIXOLON’s mobile printers support both wireless and wired connectivity options including Bluetooth, Wi-Fi, USB and Serial, making them the ideal printing hardware for a retail payment and on-the-go printing applications.